Many years ago I obtained a transcript copy of these letters but found that the transcriber, unaware of Peninsular war history had made several errors and had also been unfortunately unable to fully transcribe every word because of the difficult handwriting. It has therefore sat on my ‘incomplete’ pile for quite some time. It is only this year that I was able to personally visit Norwich for the day and viewed the original letters so that the errors and omissions could be solved. Nine years later I am happy to finally produce the journals and letters to and from Sir John Cameron of the 9th Foot in the Peninsular War. The 9th Foot does have a few memorialists of the wars, namely William Maynard Gomm, (although only for the period of Rolica to Bussaco as he served on the Staff of the army after July 1810), Assistant Surgeon William Dent, (who was in Gibraltar with the 2nd Battalion until December 1812, but was with the 1st Battalion for the 1813-14 campaigns although often to the rear behind the fighting) and Sergeant James Hale (who did serve with the 1st Battalion from Rolica till San Sebastian, where he was severely wounded during the siege and invalided home). Therefore it can be seen that the records of Sir John Cameron form a welcome addition to our knowledge of this particular regiment throughout the war, particularly as he was in the perfect position to understand the particular movements of his troops and because much of his correspondence seeks to correct the incorrect descriptions of events given in the official Dispatches and also within Napier. His version of events is therefore vital and a very important addition to our knowledge of the service in the Peninsular War of such a valiant regiment. John Cameron was born on 3 January 1733 at Culchenna, near Inverness in Scotland and originally joined the 43rd (Monmouthshire) Foot as an Ensign in 1787, and during the early period of the wars Cameron saw extensive service in the West Indies, being present at the siege of Fort Bourbon, the capture of Martinique, St Lucia and Guadeloupe until severely wounded and captured by the French in 1794. He remained as a prisoner of war on a prison hulk at Pointe Pitre for two years. Released, he returned to the regiment and gained the rank of Lieutenant Colonel on 28 May 1807 by transferring to the 7th West India Regiment. 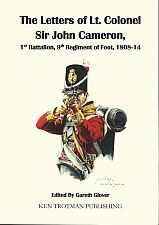 John Cameron then rapidly transferred in a sideways move into the 9th (East Norfolk) Foot on 5 September 1807 and as such commanded 1st Battalion during the majority of the Peninsular War, the 1st Battalion seeing virtually unbroken service from Rolica in 1808 to the Nive in 1814. He was therefore an almost unique witness to the wars and in later life became a fervent defender of the 9th’s reputation and record of service during the Peninsular war, which has generally been downplayed by military historians. The 9th (East Norfolk) Regiment of Foot had two battalions for much of the Napoleonic Wars and in 1808 both battalions landed in Portugal under Wellesley, the 1st Battalion seeing action at Rolica and both battalions being present at Vimiero. With the arrival of Sir John Moore to take command, the 1st Battalion marched into Spain with Moore and suffered with the rest of the army on its retreat to Corunna. The 2nd Battalion remained in Portugal with Sir John Craddock and were then transported to Gibraltar. Following evacuation from Corunna, the 1st Battalion recuperated at home for a short period, before embarking on the ill fated Walcheren Expedition where the regiment saw little action but lost many men to malaria. Soon after the 1st Battalion found itself back in the Peninsular, arriving in time to fight in the Battle of Bussaco and then retired with the army to the lines of Torres Vedras. The 2nd Battalion then marched from Gibraltar to take part in the costly victory at Barossa before returning to the rock. The 1st Battalion was present at the Battle of Fuentes d’Onoro but hardly engaged, formed a reserve at the bitterly fought Ciudad Rodrigo and Badajoz before fighting at the great victory at Salamanca and capture of Madrid. The 1st Battalion shared in the subsequent retreat to Portugal and then shared fully in the great advance of 1813, culminating in the stunning victory at Vitoria and subsequent siege of San Sebastian in which the 9th were heavily engaged. The 1st Battalion then advanced with Wellington’s Army into Southern France, being involved in the crossing of the Bidassoa, and the three day fight at the Nive. After the war, John Cameron became a Knight Commander of the Bath and was presented with the Portuguese Order of the Tower and the Sword. He became a full Colonel on 4 June 1814 and Major General on 19 July 1821. He became Lieutenant Governor of Plymouth in 1823, Colonel of his beloved 9th Foot on 31 May 1833 and a Lieutenant General in 1837. Sir John Cameron died in Guernsey on 23 November 1844.